A. J. Woodman, J. Wisse (ed. ), Word and Context in Latin Poetry: Studies in Memory of David West. Cambridge Classical Journal supplement no 40. Cambridge: Cambridge Philological Society, 2017. Pp. xvi, 182. ISBN 9780956838155. £45.00. This slim book pays tribute to the massive contribution made by David West to the study of Latin literature. West's legacy is here both commemorated and continued—indeed some of the essays read as if they had been written by West himself. The range of discussion is wide, from Lutatius Catulus to Hildebert of Lavardin, and the quality of the analysis is incisive and perceptive. This review can only briefly scan and sample the contents of this important book. After an eloquent and moving account of David West's career from Tony Woodman, Francis Cairns opens the volume with a discussion of Lutatius Catulus fragment 1. He deals efficiently with the similarity to Callimachus AP 12.73—the texts are close but there are too many divergences to plead that the one is a direct imitation of the other. Cairns states that Catulus 'presumably' (p. 5) had a (now lost) model in front of him when he composed his poem—which is an assumption he cannot really prove—but he moves onto stronger ground in his analysis of the legal language of the Latin. Under his scrutiny it is easy to picture a stuffy lawyer in love with a certain Theotimus and unable to express his love except in legalese with the usual caveats (ne ipsi teneamur) attendant on all courses of action proposed by a lawyer. Cairns does not push any single reading of the poem, but his highly detailed and meticulous analysis opens up the poem in a way which leaves the old 'copy of Callimachus' view looking seriously out-dated and inapposite. The second chapter looks at the opening of Catullus 66. Ian Du Quesnay gives a full and judicious account of the backstory behind Catullus 66, discussing the text itself and also the ways in which both Catullus and Callimachus saw fit to present the tale of Berenice in a manner which diverged from the historical sources—'a rebranding of the very reasons for the campaign and a reshaping of history' (29). Was Berenice a virgin, as Catullus 66.14 suggests? Du Quesnay discusses Justin's account of the tale of Demetrius and it is clear that Berenice was betrothed to him but never married as he had from the start preferred the mother Apama to the daughter. auctus in 66.11 is probably wrong, but Du Quesnay gives it a fair hearing before reading auectus. The essay deals with a complex set of texts (and readers may find the family tree in Fordyce p. 329 useful in sifting the homonymous folk from one another) and makes things clear while not foreclosing the discussion. Du Quesnay clears a lot of ground and leaves us with a far better sense of how both the Greek and the Roman poet chose to deal with the evidence at their disposal: we are then free to ponder the larger question of why the poets did so and how the resulting poems prioritise some themes and imagery at the expense of others. It goes without saying that the lock speaks from a position of parti pris and so her references to what might reflect badly on her mistress (the allusion to Demetrius' assassination at 66.27 for example) are nice examples of the poet's characterisation of this emotionally charged and moralistic coma. The third chapter is Tony Woodman's masterly account of Horace Epode 9, an incisive analysis which cuts through the 'voluminous scholarly literature on this poem' (45) to reach a cogent and novel reading. Woodman is thorough, engaging and rooted in the literature. The indeterminate tense of uictore...Caesare sets up a discussion about the timing of the poem itself in relation to Actium. The use of the present tenses in lines 11-16 suggests that the poem is set before the battle, but Latin does not always use the present tense for present time. The complexities of the poem are superbly handled and the suggested solution—that the poem is a symposiastic conversation on board ship after Actium between the speaker(s) and Maecenas—makes eminent sense from a poet who is a master of constructed dialogue elsewhere (e.g. Satires 1.1) and who is also adept at undercutting an initial assumption about who is speaking as the poem progresses (most obviously in Epode 2). The picture evoked here, of the sailors eagerly and happily discussing their recent experiences, is one which is also evoked by Juvenal (12.81-2) and which makes eminent sense of the closing phrases about the curam metumque Caesaris. Chapter four moves on to Propertius and his use of philosophical terminology drawn from Empedocles, in particular the coherence between Propertian discordia and Empedoclean neikos. Propertius is a love-poet, and love-poetry always contains a fair amount of both love and strife, and so Alex Hardie has to work very hard to establish a decisive link therefore between the poet and the philosopher. He unpicks the sinister and complex poem 1.22 before moving on to poem 1.1. Hardie proposes that this be read as a conversation heard at a conuiuium, parallel to Horace's 11th Epode. Milanion is both a parallel to the mad lover-poet but also a foil (in his strength and courage) to the poet as feeble slave of a domina—although in fact Milanion himself was seen as slave if we can reconstruct the characterisation given to him by Gallus from the testimony of Ovid. Hardie nicely brings in Lucretius' use of the Empedoclean interplay of love and strife in the imagery of Venus and Mars and in his words to his patron Memmius—and Lucretius was of course fulsome in his praise for Empedocles (1.716-33). Hardie goes on to say that Propertius insists on single partnerships 'including those in easily won (i.e. casual) relationships' but facili in 1.1.31 does not bear this much significance and surely means 'favourable' (OLD 9b) and contrasts the thriving love-life with the one which is fighting against divine will (as at Catullus 76.12). He is right to see the poet-lover of 1.1 as one who rejects Epicurean advice on love, languishing for over a year in his sick state, bemoaning the divine hostility (7-8) which is causing his grief. Epicureans reading the poem would see their ideas confirmed in the sorry spectacle of this pathetic figure: and Hardie presents a figure of the mad poet- lover which is both Empedoclean and anti-Empedoclean in his self-presentation. Stephen Harrison's piece on Horace Odes 2.19 is splendid. He looks at the way Bacchus had been appropriated by Antony in the 30's BC, and how, with Antony now gone, the Bacchic mantle was there for Caesar (and his friends) to pick up and use. Horace alludes to Tibullus 1.7 and this sets up a further political link as Tibullus' addressee Messalla had been lieutenant of Caesar after Actium. Horace stresses the legend of the Gigantomachy (as he did in the Roman Odes, where he adds the further hint that Bacchus is especially like the emperor in that he was born of a mortal woman but later attained divinity). There is also the poet's significant use of Liber as both a name and an indicator of his role in liberating Rome from tyranny, the tyrants Pentheus and Lycurgus here standing for Antony and Cleopatra. 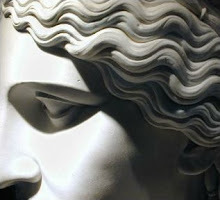 The god even has a certain youth and softness about him (as exploited in Ovid Metamorphoses 3. 607 where his boyish appearance fools the sailors) which belies the power beneath. The young Caesar, like Bacchus, was not a warrior-figure to look at, but both of them were giant-killers whom people underestimated at their peril. The poem also alludes heavily to Euripides' Bacchae and so is an example of 'generic enrichment' well suited to this god of the theatre: the end-result is that the figure of Bacchus has both poetic and political significance and is perfectly attuned by this most shrewd political poet. The late John Moles examines the importance of the Cynic Antisthenes and his view of the 'education of the strong' on both Dio of Prusa and Vergil. Antisthenes shows us Heracles receiving education from Prometheus and needing an education in strength but also in the moral choices which govern strength (cf. Plato's Gorgias 456c7-457a4). This combination of moral values and physical strength is at the heart of Anchises' address to his son (Aeneid 6. 847-53). This passage has been seen as a depreciation of the very art-form which contains it, but Moles plausibly disagrees, pointing inter alia to the comparatives (mollius (847) and melius (849). One might also add that Anchises does not include poetry among the list of arts (sculpture, oratory and astronomy) which alii will do better—and Vergil does not specify that alii refers to the Greeks as this is not the point: alii simply means 'not you' and is contrasted with tu in 851 in the priamel formula. Anchises, Moles reminds us, is also a character in the poem and not simply the voice of the author, and his 'imperfect aesthetics' are not necessarily those which are commended for all time but simply the ones needed now in this part of the education of the hero. Moles brings out the word-play here too: 'the strength of the Greek AntiSTHENES here yields to the strength of Roman RHOME'. Dio seems to have had his own reading of the debate: in his 13th oration he assumes that the Roman 'arts' are currently those of power and that future Romans need more of an Antisthenic vision of higher values. The debate engages the very heart of what the Aeneid is all about, and it is very sad that Moles is no longer with us to engage further. The book ends with a piece on Hildebert of Lavardin by Bruce Gibson, who shows how the poems recounting the ruinous state of his contemporary Rome are themselves filled with textual 'monuments' to the monuments themselves in his use of Lucan and Horace. The paradox is that the laments for Rome's downfall also recall earlier poets' laments for its (then) downfall and that Rome seems to outlive everything both physically and textually. Poem 36 both laments and celebrates the ruina which is Rome and has such lovely conceits as the gods admiring their own ruined images. The parallel poem 38 shifts the perspective on this by having Rome (now Christian) as a servant to the one God, 'the imagery of mastery...replaced by one of deference' (144). Peter is now 'more than Caesar' and Rome's pious poverty beats her old pagan glory, with provocative mockery of legionary eagles and standards. Rome has exchanged a spiritual hegemony for worldly power and she needs her new poverty to teach her the true values of Christianity: the cross has given her heaven. Quoting Rome's own classical poets amounts to both recreating that former glory in poetic form and also showing that even when it was glorious it bore the seeds of destruction. This articulate reading of a little-read poet serves to bring this delightful volume to a fascinating close. The book is well edited and proof-read, and the reader is assisted by footnotes rather than endnotes and a full bibliography, as well as a full bibliography of all the published work of the honorand. There is a general index and also an index locorum.